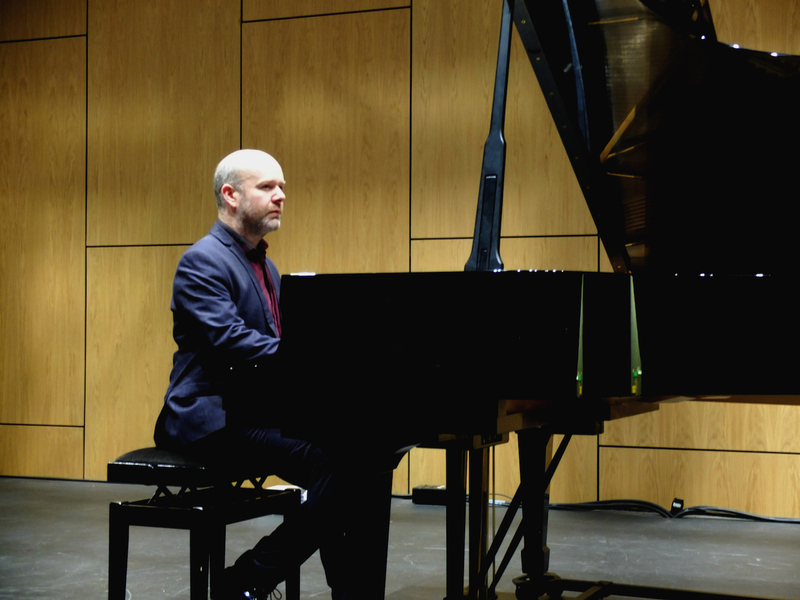 NEIL Georgeson provided a jaw-dropping display of musical prowess at Mareel in Lerwick on Thursday night with a concert that left the audience stunned and the ivories smoking, writes Alex Garrick-Wright. Dance Music was a look at different kinds of dance music, ranging from the 14th century to the very contemporary. Things started off with some of Edvard Grieg’s Norwegian Folk Dances (Op. 72) – a series of traditional Hardanger fiddle tunes arranged for piano. The Hardanger style, Neil said, was a major influence on Shetland fiddle music, and that certainly showed. Most of the pieces were jolly, energetic numbers, with a couple of melancholy and moving ones thrown in for contrast. Neil introduced the next set, Minuets, as ‘actually something different to anything I’ve ever done before’. Focussing on the minuet – the ubiquitous dance form that began in the court of Louis XIV and remained popular for two centuries – the set was a whistle-stop history of the style, covering 250 years in 18 minutes. Minuets was a very varied piece. Purcell’s sombre and spooky take sounded like something a haunted music box might play, while Scarlatti’s minuet was light and fluttery, containing the first known example of the glissando (where the pianist slides the finger along the keys like Chico Marx to create rapid series of notes). Schubert’s dark, funereal version was less of a dance, and more of a pallbearer’s march, while the final minuet by Lully (Louis XIV’s composer and populariser of the style) was redolent of periwigs and embroidered livery. The concert moved from the minuet to the style that replaced it, the scherzo with Chopin’s Scherzo No. 1. It was a blisteringly fast and unforgiving piece that could have been the end of a lesser pianist – and a lesser piano. The speed of it was mind-boggling, with Neil’s only respite being a soft and slow interlude which, he had explained, is actually a Polish Christmas carol in the middle of the piece. Possibly put there by Chopin out of mercy for the musician’s hands, the interlude felt a bit like sticking Silent Night in the middle of Flight of the Bumblebee. The second half began with the highlight of the night: Estampie, an English piece taken from the Robertsbridge Codex and the earliest known keyboard work, dated to 1306. The music sounded medieval, almost like a fanfare in places, and would have been accompanied by a heavy, stomping dance. The tune itself was excellent, more enjoyable than the minuets of far, far later composers, and would have stood up as a brilliant composition regardless of era. However, the true wonder of Estampie was the historical connotations – this piece was published and being performed when Robert the Bruce was crowned King of Scotland, Shetland was a province of Norway, and the Mongol Empire still existed. It was a fascinating addition to the concert. The gloves were on for Patrick Nunn’s Morphosis for solo piano and 3D hand sensors. Fitted with fingerless, sensor-laced mitts, Neil explained that the music would be modulated through a laptop and processed in different ways, modulated based on the movements of his hands. He off-handedly mentioned having played a Nunn piece a few years ago in Lerwick Town Hall, which used noises from space recorded by NASA, which gave a sort of clue as to what the audience was in for. Whatever they expected, Morphosis was different. Eerie, dissonant notes floated over the audience, a twist of Neil’s hand creating a tumbling, tinkling effect like a waterfall of little bells. The stage bathed in baleful blue light, the uncanny music was given eldritch life with every waver and flick of the hand, turning notes into shrieks and sinister nattering, and producing the atmospheric sounds of war-drums, or a church bell falling down a flight of stairs. Uncomfortable, unearthly and borderline Lovecraftian – but genuinely gripping. Standing to a slightly stunned applause, Neil ruefully advised that there had been a problem with the effects, and that they had – in fact – not been operating properly for the end of the piece. Nobody in the audience would have known this, but it was a testament to Neil’s artistic integrity that he was honest, and tried to play the finale again (it later transpired that the software had crashed, and there was nothing Neil or anyone else could have done to prevent or fix it). The audience was greatly appreciative nonetheless. Some Debussy waltzes were the palette cleanser; sumptuous and very French. Full of Debussy’s iconic pairing of delicate intricacy and stirring force, they ended in a dizzying cascade of notes and wild applause. Blue Danube, one of the most famous pieces in the world, was Neil’s final challenge – a concert paraphrase by Adolf Schulz-Evler. What an understatement. Blue Danube was not a piano arrangement of the tune – it was a piano arrangement of Strauss’ entire orchestral waltz. The flow of notes out of the piano did not stop for one instant, Neil’s hands a blur of motion as the magnificent music left the audience breathless. One moment, he was playing the string section, the next the brass, and after that- apparently one in each hand. And yet – it was still recognisably Blue Danube, and the best version anyone in the audience had ever heard of that celebrated tune. The music built and built to an explosive and breath-taking finish, and the audience responded appropriately. How Neil was able to come back on stage to perform a Chopin piece as encore defies belief – he should have had his hands in buckets of ice. With Dance Music, Neil truly has outdone himself. The concert contained some of the most impressive and peerless performances anyone in the audience has ever seen, and that Neil was able to pull the entire thing off without a single slipped note entirely from memory (he was going too fast for sheet music to have been anything but a hindrance) was surely the mark of a master.